Australians love to travel the world. In 2011 more than 7.5 million Australians (or more than one third of all Australians) travelled outside the country. Of course, most Australian travellers abroad have enjoyable visits free of danger or mishap. But occasionally, they hit the headlines for the worst reasons – they die as a result of misadventure, are victims of robbery or violent crime, overdose on drugs or as a result of alcohol-fuelled violence or accidents. Already this year three young Australians have died in Laos, a generally peaceful destination popular among backpackers seeking an off-the-beaten-track experience. Another Melbourne teenager only narrowly escaped death. Two of the deaths resulted from accidents incurred from “tubing” in which people floating on an inflated tyre inner tube attempt to negotiate river rapids, often drinking at riverside bars along the way. Many of the tubers tend not to factor in sharp rocks, precipitous drops and whirlpools. Local tour operators do not provide protective clothing or head covering along the treacherous waters. So how can you prevent young travellers from engaging in such risk-taking behaviour? For Australians of all ages, but especially among the young, risk-taking is seen as an integral part of the travel experience. Great American writer Ernest Hemmingway inspired adventure travellers around the world with his tales of travelling on the edge. 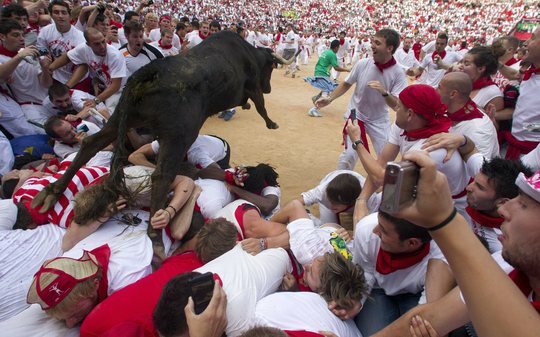 Each year, thousands of youthful Hemmingway inspirees head to Pamplona in Spain for the annual “running of the bulls”. Australians figure prominently among their ranks and also among those who feel the sharp end of an angry bull’s horn, occasionally with fatal consequences. Likewise, in February hundreds of young Australians gather at the Full Moon Party held at the Thai island of Koh Phangan at which they are encouraged, in fact urged by organisers to drink buckets of spirits for the equivalent of $3 per bucket. This alcohol fueled “party” frequently descends into drunken brawls and watery misadventure. Taking risks abroad, free from the control of parents is seen as a “rite of passage” for some young Australians travelling abroad. The risks taken may range from binge drinking, drug experimentation, base jumping, mountaineering and sexual promiscuity to visiting the crime-infested, seedy districts of foreign cities. But taking these kinds of risks can prove fatal and also costly for governments helping tourists in trouble. The Australian Department of Foreign Affairs and Trade annual report reveals some rather telling statistics. In the year 01 July 2010-30 June 2011, DFAT attended to 313 arrested and imprisoned Australians overseas, 1,203 Australian who were hospitalised abroad, 12,899 missing persons and tended to over 24,000 enquiries from Australian’s who experienced loss or distress while overseas. The taxpayers handed out loans totalling $325,000 to over 300 Australians who needed emergency financial assistance while abroad, most of this to cover repatriation costs. Paula Ganly, Department of Foreign Affairs and Trade (DFAT)’s Assistant Secretary Consular Policy Branch, explained at a UN World Tourism Organisation conference in September 2011 that DFAT’s Smartraveller campaign sought to minimise and streamline the reliance of Australian travellers on consular services through three key strategies. The first was to urge travellers to take out travel insurance, the second was to encourage Australians to register their travel plans on the Smartraveller website and the third was to encourage travellers to closely monitor the information contained on the website about the country they intended to visit. While DFAT’s strategy makes good sense to sensible travellers, young risk-takers are hardly more likely to register their travel plans with the government than they are with their parents and DFAT’s own research has borne this out. Laurie Ratz, from the Insurance Council of Australia pointed out at the same conference that there are certain patterns of behaviour which are uninsurable. A careful fine print perusal of most travel insurance policies will show that most travel insurance providers won’t cover claims from policy holders whose injuries or deaths arise from heavy drinking, drug-taking or accidents that occur undertaking unorganised high-risk activities or sport. Many insurers will cover injuries or loss sustained for people who engage in risky activities which are part of an organised adventure tour program, sometimes at a higher premium. For travellers taking out insurance with the hope it will cover everything, it’s a case of caveat emptor, or buyer beware. It is certainly worth taking the trouble to read the fine print. As an extra complication, risk-taking travellers booking through internet sites can expect far less after-sales support than they would receive from traditional travel providers such as wholesale tour operators and travel agents should they need to alter their return travel arrangements while recovering from injuries sustained in taking extreme risks. 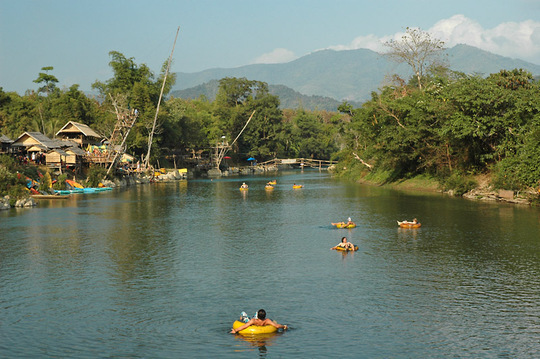 In view of the tubing fatalities in Laos and the possible negative implications for the reputation of Laos as a tourism destination, the Laotian Ministry of Tourism may choose to adopt a practice used by the Tourism Ministries in many countries to license and set minimum safety standards for all tour operators engaged in “adrenaline activities”. This applies to such activities as bungy jumping in New Zealand. This way, those travellers who choose to engage in tubing will have an indication of those operators which operate in accordance to an agreed set of standards. For a small minority of travellers, taking extreme risks will always exert an attraction – even though there may be fatal consequences. But the travel industry, government and insurance providers need to send a clear and unambiguous message to travellers that if they want to engage in extreme risk behaviour when they travel abroad, they cannot expect the “nanny state” they ignored will automatically spring to their rescue.